One of the wonderful things about food (and wine!) is that it has a ability to transport you to a different place, even if you are actually stuck in a snow globe in Colorado. One benefit of living in my tiny apartment is that the aromas of the food easily fill my house. 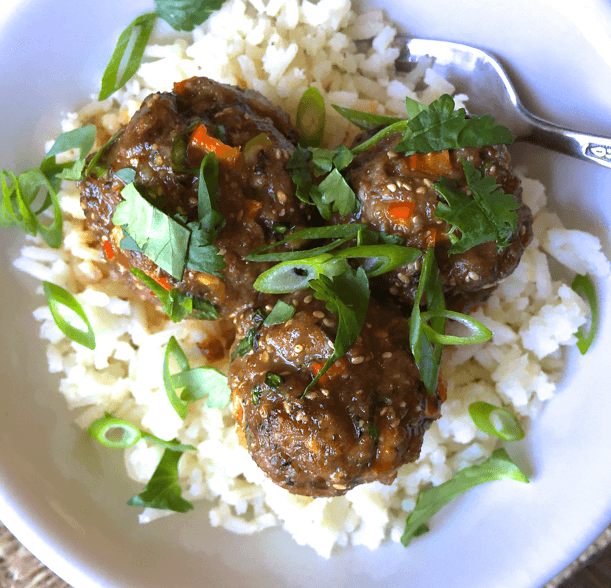 Once you sit down on the couch with a bowl of these meatballs, close your eyes and you have arrived on a hot, humid beach in Thailand with the waves crashing into the shore. Ahh…. 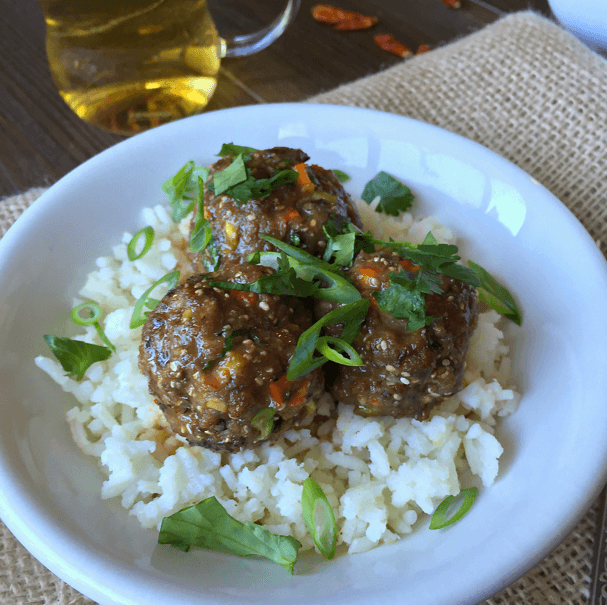 This was my first time using chia seeds in meatballs. As you know, Ben is allergic to eggs, but I had always just used bread crumbs and not tried to actually replace the eggs. 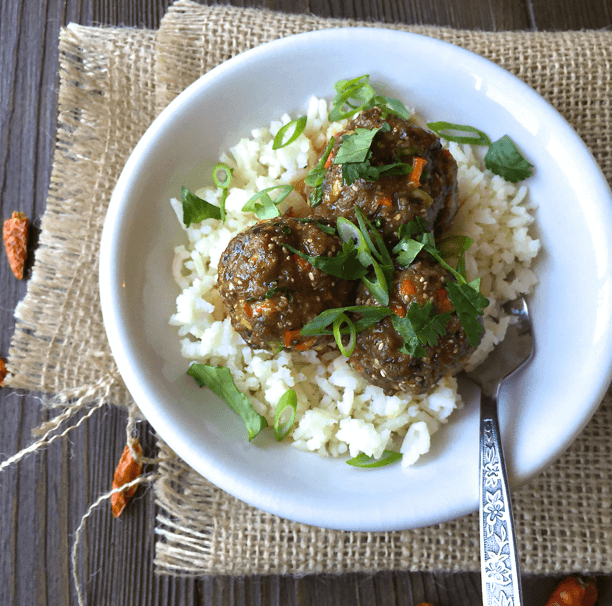 Boy was I making a mistake- the chia made these the most TENDER meatballs I have EVER had, egg or no egg! I chose to still add breadcrumbs to my meatballs, but you could definitely omit them for a gluten-free option. 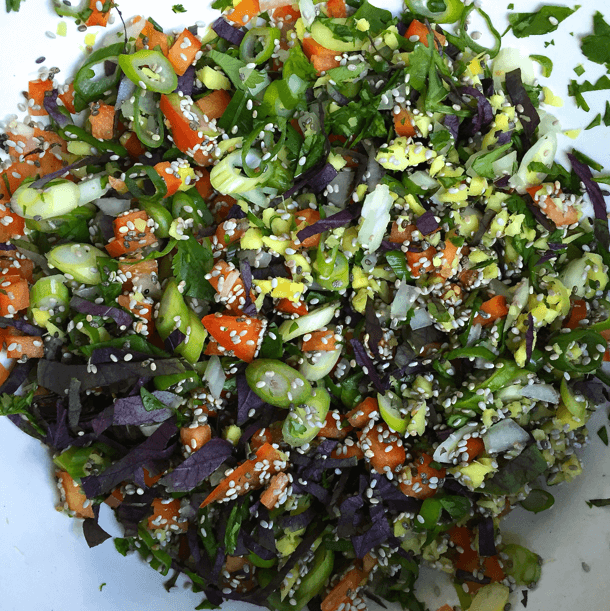 I love how all the fresh vegetables and herbs look in the mixture! 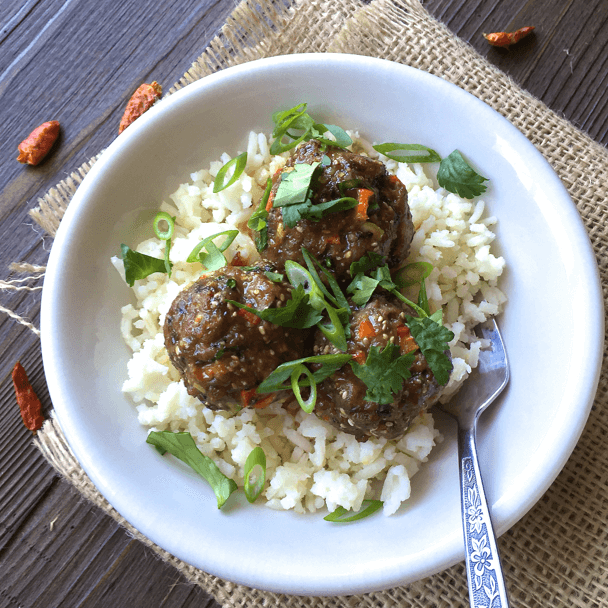 Who would have known that these meatballs were packed full of healthy veggies and detoxifying ingredients like ginger?! Any leftovers also make a great Thai-Style meatball sub! For the meatballs, preheat the oven to 400F. 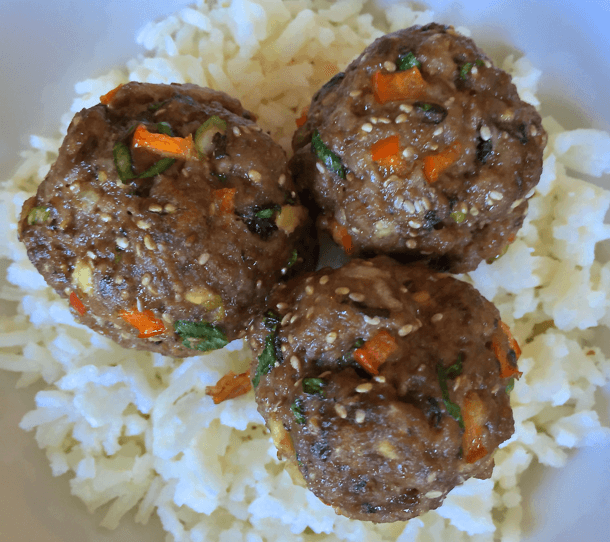 Combine the meat, chia seeds, bread crumbs, ginger, red bell pepper, green onion, yellow onion, cilantro, basil, soy sauce and Siriracha in a large bowl. Mix well to evenly incorporate everything. Coat a baking sheet with foil and a small amount of oil. 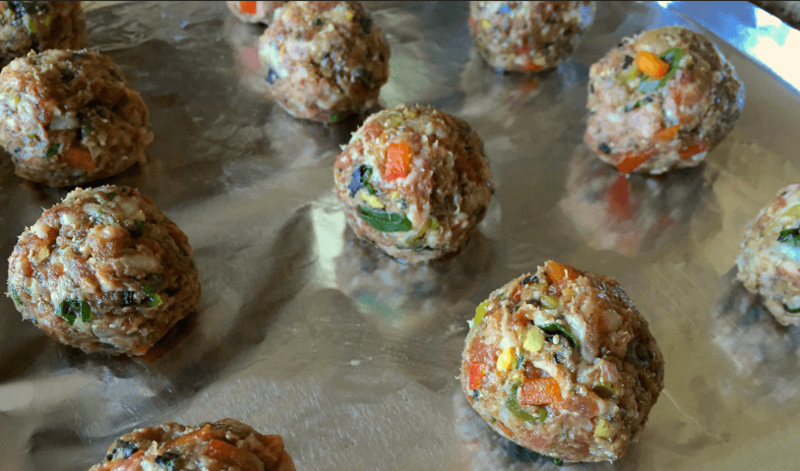 Place the meatballs evenly on the baking sheet. Bake at 400F until cooked through, 155F for pork or 165F for turkey, about 10-15 minutes. For the sauce, combine ginger, garlic, onion, coconut milk, lime juice, soy sauce, Thai chiles and cilantro in a medium saucepan. Bring sauce to a boil, then reduce to a simmer. Let simmer for 5 minutes, then remove from heat and let steep for 5 additional minutes before straining. 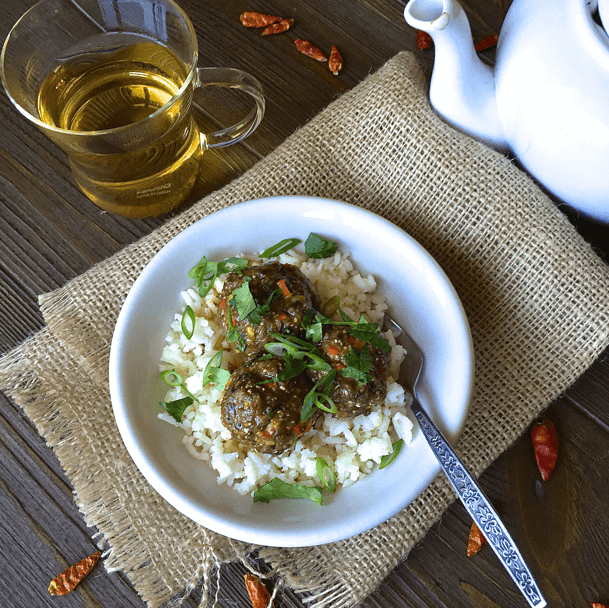 To serve, place meatballs over rice and coat with coconut ginger sauce. Garnish with fresh cilantro and green onions. Thanks! They are SO freaking good!